Sunnyfield’s Community Services Hubs offer a range of group-based programs so you can try new things, learn additional skills, meet new friends and get involved in your community. 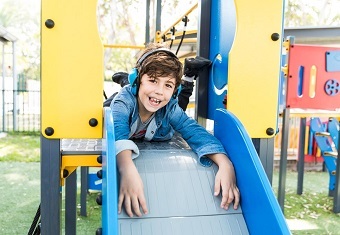 Our group-based school holiday programs are designed for children with disability aged 6 – 11 years, and include a fabulous range of activities such as music, dance, sport, arts, games and fitness. Our group-based programs are designed for people with disability aged 12 – 17 and jam packed with loads of super cool activities, so you can go places, make new friends and get active. Our group-based programs for 18+ offer a range of healthy, active and adventurous activities to do and see. Expand social networks, try new things and get your kicks after six with Sunnyfield.